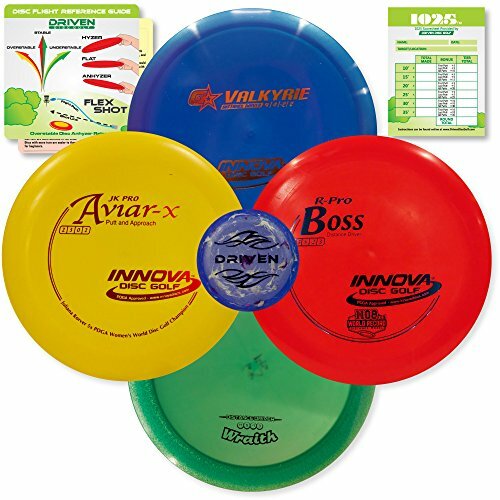 The Innova Disc Golf Championship sets are designed for advanced players. The are a great choice for experienced players who already own a Driven starter set and are looking to add some faster discs to their collection. All of the discs included in this set have been used to set (or break) World distance or speed records. We've also include a few extra bonuses: a pad of 1025 scoresheets, a disc flight reference card, and a Driven mini disc. As always, our disc golf sets include a 100% satisfaction guarantee. THROW THE DISCS THE PROS THROW - Includes 4 World Record Breaking Discs in Premium Plastics. DISTANCE DISCS: R-PRO BOSS (current WORLD DISTANCE record at 1109 ft) and G-STAR VALKYRIE (previous DISTANCE RECORD holder thrown 820 ft). HIGH SPEED DISC: BLIZZARD CHAMPION WRAITH - holds the current record for the HIGHEST SPEED clocking in at 89.5 MPH (thrown by Simon Lizotte). This disc was also used to set the WOMEN'S DISTANCE RECORD of 568.5 ft by Jennifer Allen. J-PRO AVIAR - the Aviar is the putter of champions! It has been used to win more World Championships than all other putters combined. ADDED BONUSES: includes "1025 Scoresheets," "Disc Flight Reference Card," and FREE "Driven Mini Disc" (mini discs vary in size from 2.5" to 6"). If you have any questions about this product by Driven Disc Golf, contact us by completing and submitting the form below. If you are looking for a specif part number, please include it with your message.